Homemade Maple Walnut Granola, an easy 20 minute homemade granola recipe made with maple syrup, walnuts, and cinnamon. Slightly sweet with a perfect crunch! To say I’m an “oatmeal” person is an understatement. I can safely say I have eaten oats for breakfast at least four days a week for the last…ten years? Does that make me basic? Maybe. But I don’t care, oats are delicious. Oats are such an easy and flexible first meal and I’ve been known to get a bit creative with my toppings. Cranberries and maple for fall, strawberries and cream for summer and every fresh seasonal fruit in between. Granola. Maple Walnut Granola, to be exact. In the years I’ve been an oatmeal aficionado I must admit that I never made homemade granola. It baffles me now as to why this is, but it just wasn’t something on my radar. 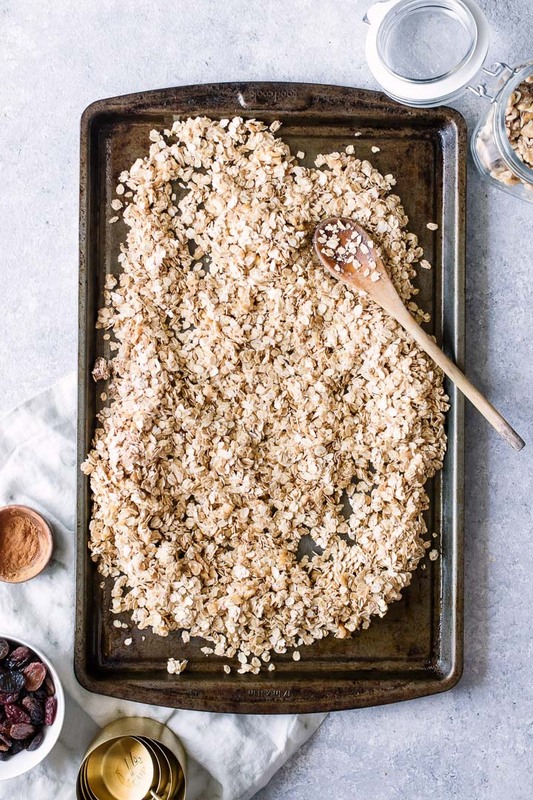 I had no idea that a little time in the oven could turn dry oats into a delicious and crunchy granola that makes fruit, desserts and yogurt even more delicious. And granola on top of oatmeal? It’s like the “Inception” of oats. So how easy it making granola? Let’s break it down. 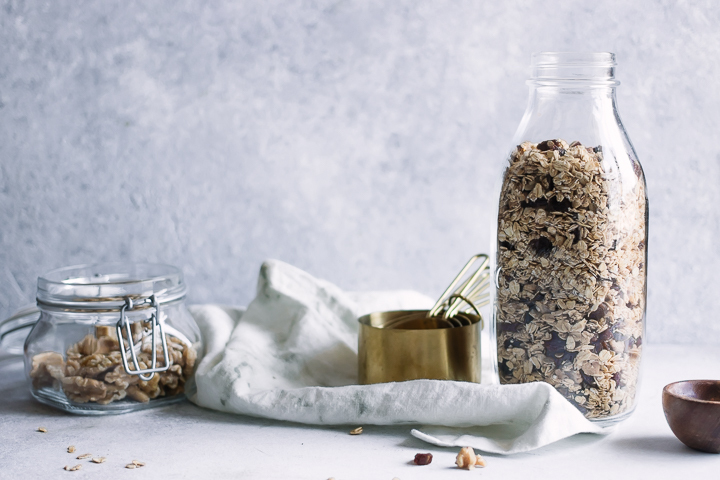 The flavor and ingredients variations for homemade granola are truly endless, but below are the basic steps to nailing a simple granola recipe each and every time. Mix dry oats with a small amount of liquid to get the perfect crunch. The wonderful crunch from baked granola comes from the drying out of slightly wet oats while in the oven over a low heat. 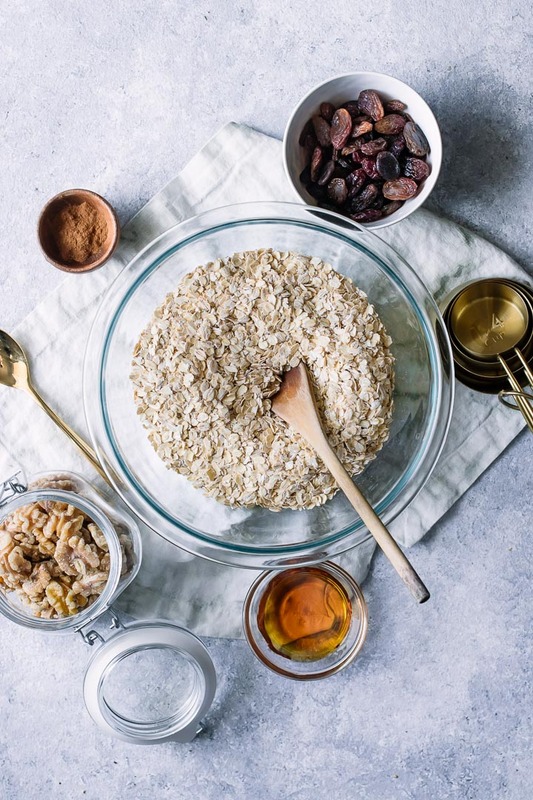 Liquid sweeteners like maple, agave and honey add a slightly dampness when mixed with oats and also provide a sweet flavor. Add fruit toppings after baking – keep them fresh and seasonal! I love using fresh seasonal fruits and crushed nuts and seeds when making homemade granola. However, consider what topping will bake well. I add nuts, seeds and other dry ingredients that bake well before putting the granola in the oven, but other ingredients like dried fruits do not bake well (trust me, I learned this the hard way when baking cranberries – burnt cranberries are not a good taste!). Bake longer at a lower oven heat. Each oven is different and may require a different heat, but I bake my oats for about 20 minutes at 250 degrees (or even lower). Baking on a higher heat means the oats dry out faster and are more likely to burn. I’ve found that baking at a lower heat for longer gives oats more time to dry slowly and lends a better crunch all around. Have a little patience! Store and enjoy! Granola can be stored in a sealable container or jar for months, so batch cook a large portion once a month and enjoy for weeks to come. I love preparing a new batch every month and using seasonal ingredients and spices. Good old fashion rolled oats. Any oats will do, but I like the large, old fashioned oats because they make for a crunchier granola. One of my favorites is Bob’s Red Mill Organic Old Fashion Oats. Organic Maple Syrup. The maple syrup industry is a great example of a sustainably sourced sweetener, especially if buying certified organic (which means no artificial colors or flavors are added to enhance appearance and taste). A brand I know and love is Butternut Mountain Farms. Durable (and environmentally conscious) cookware. I can (and will!) write an entire post on environmentally conscious cookware but the bottomline is that much of the cookware we use contains materials that are not sourced sustainably. This does not mean you have to throw out all of your pots and pans and start over, but instead means that when you are replacing your cookware you are choosing pieces that are environmentally conscious. This sheet pan from Lodge is a great example: cast iron, durable, and not coated with nonstick materials. Grinding stone for crushing nuts and seeds. I picked up the wooden grinding stone pictured here in a small market in Thailand, but this is a more traditional grinding stone. I wasn’t sure if it was something I’d use when I first bought it but it’s proven useful time and time again, and the stone version will last year years (if not decades). Craving more simple breakfast recipes featuring superfoods? Check out our Black Cherry Basil Ricotta Toast and Smoked Salmon Breakfast Bowl recipes, both featuring simple superfoods but in unique and inspired ways. 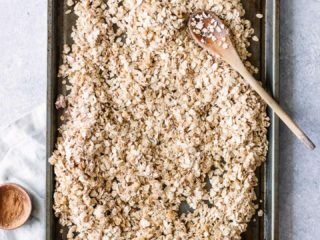 Did you make this Maple Walnut Granola? Leave a comment below and rate the recipe to let us know how it turned out. Save this recipe for later by pinning to your favorite breakfast Pinterest board and make sure to tag me on Fork in the Road’s Instagram to show me your granola creations! Maple Walnut Granola, an easy 20 minute homemade granola. Made with maple syrup, walnuts and cinnamon, it’s slightly sweet with a perfect crunch. Toss oats, crushed walnuts and cinnamon dry ingredients together. Stir in maple syrup to lightly coat dry mixture, but not soak (use more/less if needed). Spread on a lightly oil greased sheet pan and bake for 20-30 minutes, or until dry and crunchy but not burnt. Stir 1-2 times throughout cook time to evenly cook. Enjoy in and on smoothies, yogurt and oatmeal bowls…or with your favorite milk or milk alternative for a crunchy cereal. Notes // Tips: Substitute walnuts for other nuts and seeds, such as pecans, almonds, or sunflower seeds. 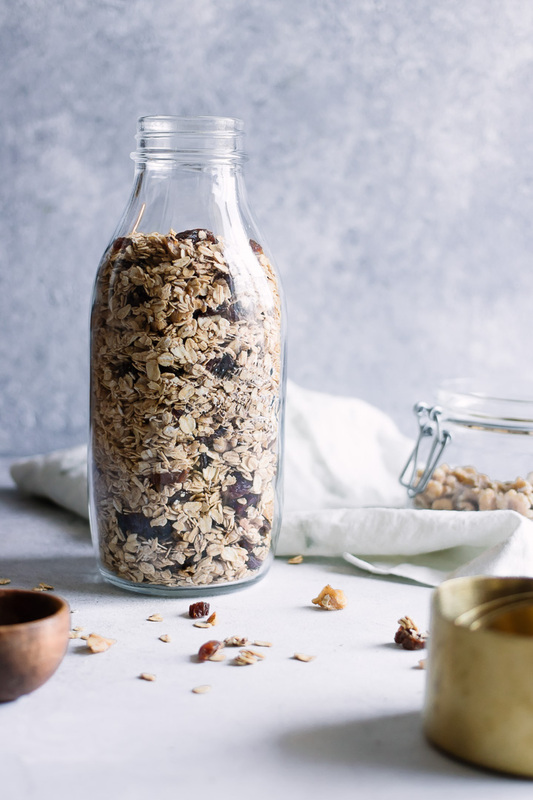 Leftovers & Storage: Granola can be saved in an airtight jar or container for months, which makes it a great recipe to cook in large batches. Nutrition: This simple homemade granola recipe is a great topping for yogurt bowls or eaten as a cereal with plant-based milk. It is a good source of fiber, plant-based protein, and healthy fats from nuts. I love buying granola but it’s so expensive. This is a great idea to make your own, I will definitely try it next week instead of buying it at the store. It is very expensive, the 12oz bags at my grocery store are $7-$9. Making at home takes a bit longer but it’s much cheaper AND healthier because I know exactly what I put in it. I hope you enjoy!